Becoming an expert is easy. Simply know more than the people who you are talking to. 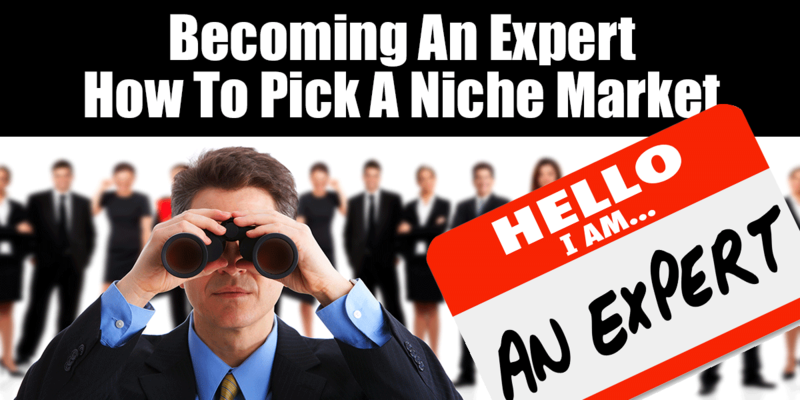 The big question is how to pick a niche market to become an expert in…that is the rub! I follow a gal who is simply amazing. She has been a hip-hop singer, waitress, coach, author, speaker, and many other things in her life and has somehow found a way to bring them all together in one magic bottle. Good on her! The problem for me is that she is telling other people that they can do the same. Having worked with hundreds of small business owners over the years, I can tell you that most small business owners are not super clear about having products or services for one niche market, let alone trying to encompass two or even three markets. Entrepreneurs (like me) love the idea that we can do anything, be anything and accomplish it all at the same time, so this idea of multi-channel efforts sounds great. Unfortunately for most of us, unless we keep our eye on the prize for one specific goal, for a fixed period of time, we veer off in all kinds of interesting and exciting shiney new directions, waking in a couple of months with a joy hangover but having not moved our business forward in any kind of cohesive manner. Hopefully this post will help you to figure out a topic that you can become an expert in, and then give you some clear, concise steps to take to get you there. There is one school of though that say you should pick a giant niche that you can slice into chunks. I am up in the air about this one because I follow this model (somewhat). I want to be know for “marketing”. I want right of first refusal anytime you have a question about marketing, whether it is for coaching, which training program you should buy or whether I want to write a blog post about it. That said, there are hundreds of kinds of marketing that I don’t know about/provide support for like Facebook paid ads, mobile marketing, local SEO, viral videos, enterprise level marketing, the list goes on and on. For me to try to rank for the search term “marketing” on Google, I would have to beat out 441,000,000 competing sites like Wikipedia, the American Marketing Association, Entrepreneur.com and host of other huge names. While that term gets 60,000 searches a month, how many of those are for something that is a kind of marketing that I don’t do? So what if I go narrow for a niche marketing term like “Customer Demographics”. It only gets 70 searches a month according to Google, but I get almost 2,000 web hits per month to the two main pages that I rank for this term. That is some powerful Google mojo, but I am not a demographics or numbers kind of gal except as it relates to SEO and searches (then I can geek out with the best of them!) That said, it is a great place to promote my Marketing Strategy Workbook and a Perfect Customer Profile Ebook I wrote with a marketing partner. Writing about “thin slices” of marketing like “customer demographics” and “choosing a niche” allow me to rank highly for smaller pages on my website which in turn leads to ranking more highly for my top term of small business marketing. Although I may never get to page one for that term, I will have a site that overall ranks highly for many key marketing terms. All that said, does that mean you can’t combine passions? Absolutely not! Just recently I met with a gal who was having trouble getting her nutrition business off the ground. She was battling all the other people out there pitching cleanses and eating healthy and getting no where. We spent some time figuring out what her passions were in addition to nutrition and found out that she is a complete geek about doing nutrition (making her own meade and trying to understand the chemistry behind how a sourdough starter begins). She is a also a HUGE outdoor gal who would spend all her days cooking over a campfire if she could….BINGO! We rebranded her with “Nerdy Nutrition” and her target market for many of her custom products is going to be for people who are trying to maintain a healthy lifestyle while camping and hiking. The neat thing about this is that if all Chris got to do was spend all her time outdoors, cooking and talking food with other wilderness people, she would be in heaven. When you can find a realistic junction point between your passions, you can really make some magic! Okay, here is where the rubber meets the road. Marketing online and offline are much different animals. My offline “Marketing” persona is rock solid. 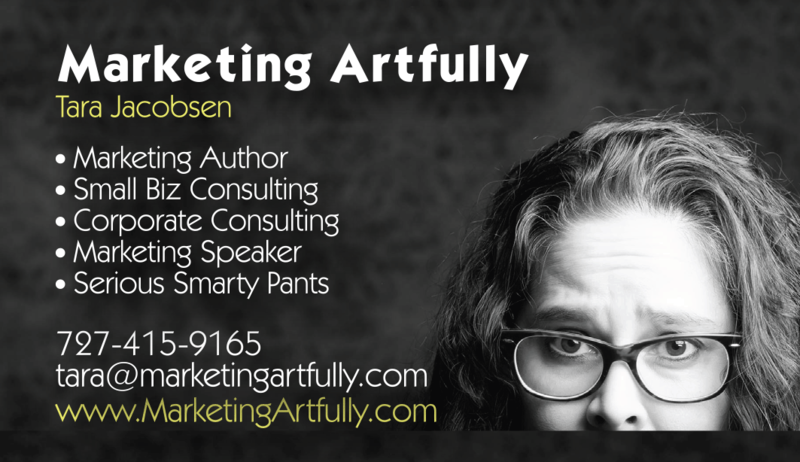 My business card reflects that I am a marketing speaker, author and consultant. I speak locally and nationally about all kinds of marketing topics and am super happy with how well branded I am as a “marketing expert”. Online marketing is where you have to be super sure that you are presenting your best “face” forward. Your website and social profiles all need to line up and show that you are something specific. You need to know what you want to be an expert for so that you can make your website reflect that. There are a number of different ways this comes across, overtly and more subtly. About Us Page – Make sure your about us page states clearly what you are an expert in. I am huge fan of searching for experts in other fields and then modeling their about us page for your industry. Speaker or Other Page – The cool thing is you don’t have to limit yourself to just one page. I have an about us page and a marketing speaker page. It targets marketing speaking and LOCAL Denver marketing speaking. The cool thing is that I get invited to speak at national events that are held here in Denver since they don’t want to have to fly everyone in and put them up! I have my TaraJacobsen.com domain name pointed to this sub page. One thing that I think people get wrong is thinking that someone is going to be looking for an expert using Twitter, Pinterest or Facebook (they might using LinkedIn). Instead there is a slow insidious process behind the scenes where they notice you talk a lot about your topic, then start to realize you are pretty smart, THEN they look to you as an expert. Another thing that happens is that you get put on lists that other people use. For example I have a list on Twitter of Marketing People I like that is public. Other people have subscribed to that list and now they can follow the cool marketing people I like too! Twitter – You need to make sure that you have your industry hashtags in your description. Most people sifting through the sea of Twitter handles will look for a #marketing speaker, well before they will try to find a speaker in that mis-mash of humanity. Here is my Twitter description :: Taradactyl on Twitter. Pinterest – You need to have your expert keyword terms at all levels from individual pins, to boards and onto your profile description. Facebook – Facebook’s search capabilities are very limited so you will want to have a page with your expert status listed in the actual title if FB will one of your key marketing channels. Google Plus – There is amazing search capabilities in Google+ so just make sure you have your expert keywords in your profile or page description. LinkedIn – There are whole books written about how to have a great LinkedIn description. Here is a walkthrough of how I optimized my LinkedIn description “perfectly”. Instagram – You may be surprised to see Instagram on the list, but this is hot up and coming network that is owned by Facebook. The key to Instagram search is hashtags so make sure to research those so you can rank well! It is definitely worth taking the time to optimize your site and your social profiles when you are becoming an expert in a market niche! Each and every little thing you do adds up to help define you as your ideal profession so take the time to review all your profiles and make sure they are up to snuff!